One thing is sure is that Duracell makes tons of ads for their batteries. Everyone knows this a marketing technique and not a proof of their value. Which one should you buy? I suggest you read the rest and make your own mind. No big surprise here. I paid 19% more money for the Ultra power but price vary a lot depending on the quantities and where you buy them. I found Amazon.de to have a decent price and a vast choice in quantities. 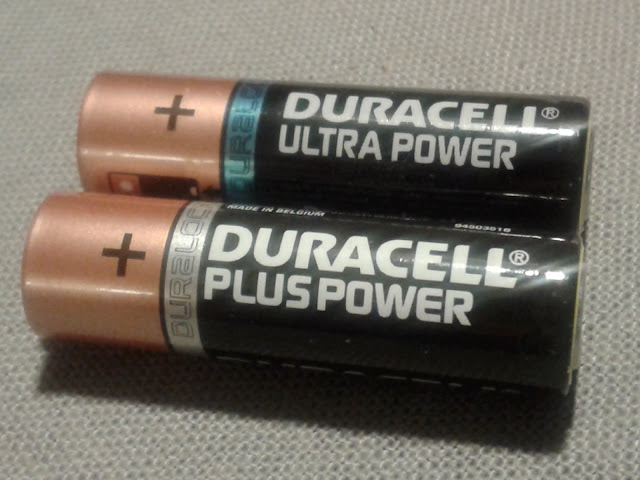 Duracell batteries are usually far from being the best value for money. Which is good for an Alkaline battery but is easily beaten by rechargeable NiMh batteries. 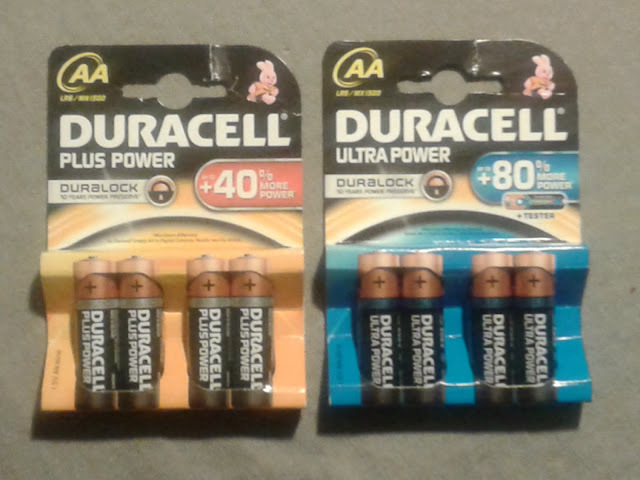 Regarding energy stored inside the cells, in this case Duracell prices are consistent with battery capacity. Energy wise, they have both the same value for money. Not the same thing as energy, power describes how much energy can be delivered by the battery in an amount of time. A more powerful battery will be able to deliver the same amount of energy but faster. Here we measure power with the battery's internal resistance, measured in miliOhms (mOhm) and lower is better. Powerful batteries are especially good for high drain devices (such as flashes). The values are good for disposable Alkaline batteries but will be easily beaten by rechargeable NiMh batteries. I would never use Alkaline batteries for high drain applications. All batteries discharge by themselves. You leave them on the shelf and they will loose their energy over time like a leaky bucket (and the internal resistance will also increase). Alkaline batteries are known to have a very low self discharge rate and last for many years. This feature make disposable Alkaline batteries best suited for appliances virtually never used or consuming very little. The word 'Duralock' on Duracell's packaging advertises for 10 years of shell life. Although we have no way to get 10 years old batteries we are keeping a couple of fresh batteries to see how they age. Stay tuned. The Duracell Ultra Power batteries have about 19% more energy and are about 19% more expensive than the Duracell Plus Power. When I buy disposable alkaline batteries, I want a battery that will live long on the shelf (e.g. for a smoke detector or remote control). It is my opinion that high capacity disposable alkaline batteries can have a use in emergency devices that are never used but need to be ready for an intensive use whenever the need arises (e.g. an emergency torch/flashlight). Higher capacities and power can be provided for less cost by rechargeable NiMh batteries and long shelf lives are also provided by regular Alkaline or disposable Lithium batteries. ... oh and by the way the +40% and +80% are probably just a marketing thing as I could not explain these figures.